Destiny 2's Titan is the heavy hitter class, able to deal out massive amounts of damage all while absorbing damage on behalf of their teammates. 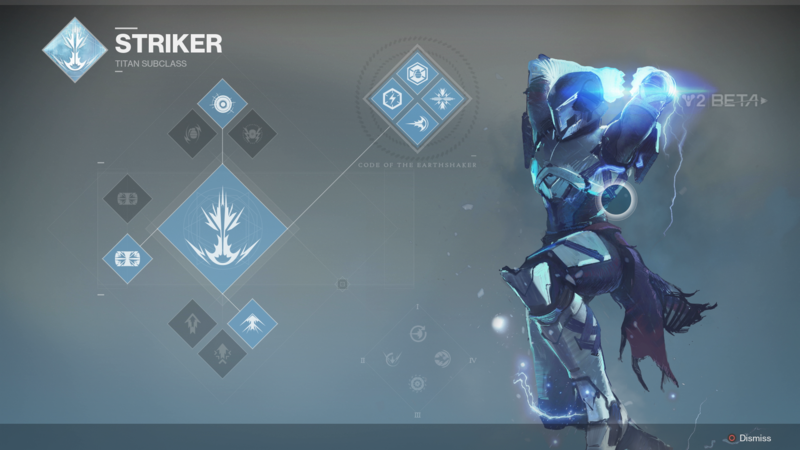 In this Destiny 2 Titan guide we'll detail everything you need to know about all the Titan's abilities in Destiny 2, including Titan Super Abilities for the Sentinel, Sunbreaker, and Striker subclasses, special grenade abilities, and exclusive items that only the Titan has access to. If you need anything else at all on the game, then be sure to head over to our Destiny 2 guide hub, which contains information on everything in Destiny 2 beta, as well as all the info you need on the other classes in the game. Back in the original Destiny, the Titan had the Dawnhammer Super Ability, where the player was able to throw several fiery hammers at any enemies on the battlefield, dealing massive amounts of damage to them in the process. The Dawnhammer is actually making a return for the class in Destiny 2, and the Titan has several brand new Super Abilities through the Sentinel and Striker subclasses. To unlock the second and third Titan subclasses in Destiny 2, you'll need to keep an eye out for any side missions you can undertake near the Shard of the Traveler in the European Dead Zone. When available, these missions will let you take down a horde of Fallen using the Super Ability of the brand new subclasses you're trying to unlock. It doesn't take more than a few minutes to complete, and it's effectively a basic tutorial area for your new Super Ability. Rally Barricade - Hold Circle/B to create a small barrier that allows the player to peek over while aiming down sights. Instantly reloads weapon when you take cover. High Lift - Jumping while airborne activates Lift, launching you higher into the air. Strafe Lift - Jumping while airborne activates Lift, launching you into the air with strong directional control. Catapult Lift - Jumping while airborne activates Lift, launching you into the air with a strong initial burst of momentum. Featured in the Destiny 2 Beta, we now know numerous details about the Titan Sentinel. 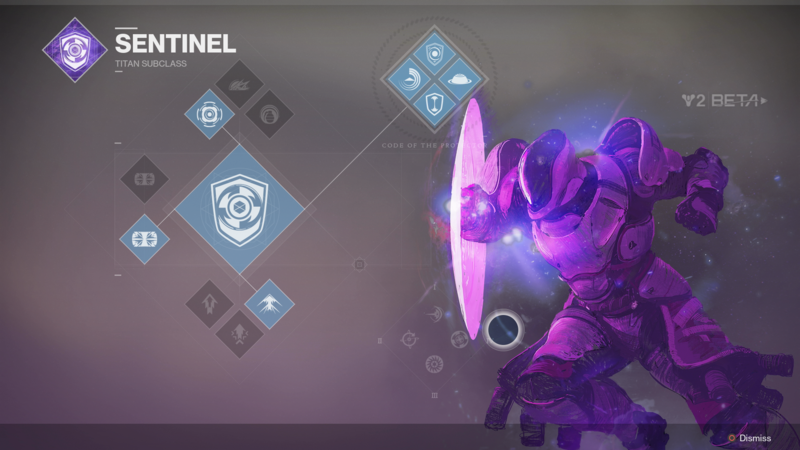 The Sentinel subclass has a shield ability not unlike Captain America, able to both batter enemies up close with a glowing purple shield, as well as throwing said shield around the vicinity, bounding it off walls and straight into enemies. L1+R1/LB+RB - Summon a shield of Void Light. R1/RB - Attack with shield. Magnetic - Attaches to enemies and explodes twice. Voidwall - Creates a horizontal wall of burning Void Light. Suppressor - Explosive that prevents enemies from using abilities for a short time. Defensive Strike - Kill an enemy with this melee ability to create an overshield around you and nearby allies. Rallying Force - Melee kills restore health for you and nearby friends. Turn the Tide - Overshield from Defensive Strike lasts longer and increases melee damage and reload speed. Ward of Dawn - When Super energy is full, hold L1/LB+R1/RB to create a shielding dome. Superior Arsenal - Grenade kills recharge your Grenade energy. Shield Bash - After sprinting, use melee to unleash a Shield Bash that disorients enemies. Second Shield - Gain an extra Shield Throw charge while Sentinel Shield is active. In the Trenches - Kills while surrounded by enemies reduce the cooldown time of your Super. Unlike the Sentinel subclass, we did have access to the Titan Striker subclass at preview events, so we've been able to go hands on with the subclass that feels a lot like the original Titan subclass from the first Destiny. The Titan has s similar ground slam Super. L1/LB+R1/RB - Supercharge your fists and slam into the ground. Flashbang - An explosive that disorients enemies it damages. Pulse - Periodically damages enemies inside the explosion radius. Lightning - Sticks to any surface and emits bolts of lightning. Aftershocks - Damaging enemies with a Seismic Strike recharges your grenade. Magnitude - Gain an extra grenade charge and increase the duration of grenade effects. Terminal Velocity - The Fists of Havoc Super leaves a damaging field behind, dealing more damage the longer it’s in the air. Seismic Strike - While sprinting, use a melee attack to shoulder charge an enemy and create an Arc explosion. As with the other Warlock and Hunter classes in Destiny 2, the Titan class is also retaining the subclass that it received through the Taken King DLC pack in the original Destiny. L1/LB+R1/RB - Summons a flaming hammer, which you can repeatedly thrown at your enemies.. Magnetic Grenade - Attaches to enemies and explodes twice. Voidwall Grenade - Creates a horizontal wall of burning void light. Supressor Grenade - Prevents enemies from using abilities for a short time. Hammer Strike - Use this melee ability while sprinting to unleash a burning hammer. Tempered Metal - Any Solar ability kills grant you and nearby allies movement and reload bonuses. Battle-Forged - Enemies killed by the Hammer of Sol Super Ability explode. Vulcan's Rage - Hammers of Sol explode upon impact. Mortar Blast - When used, this melee ability causes enemies to explode, setting others on fire. Sun Warrior - All Solar ability kills restore player health. Rings of Fire - While standing in Sunspot, your Solar abilities charge faster and the Hammer of Sol lasts for longer. Solar Siege - Hammer of Sol creates sunspots where the hammers strike, and you throw hammers faster while in the Sunspot. So, how does each Titan subclass play? Not a whole lot differently from the original Destiny, honestly, as the Titan still has a very defensive subclass through the Striker's Towering Barricade and Rally Barricade abilities, while also having an offensive subclass through the Sentinel abilities.